Welcome to the CPE4U Colorado website! CPE4U Colorado has been providing excellence in tax education for more than 25 years, offering a wide variety of high quality, affordable continuing education seminars for accountants, enrolled agents, attorneys, and tax return preparers in Denver and several other Colorado cities, taught weekdays from late April through early February. 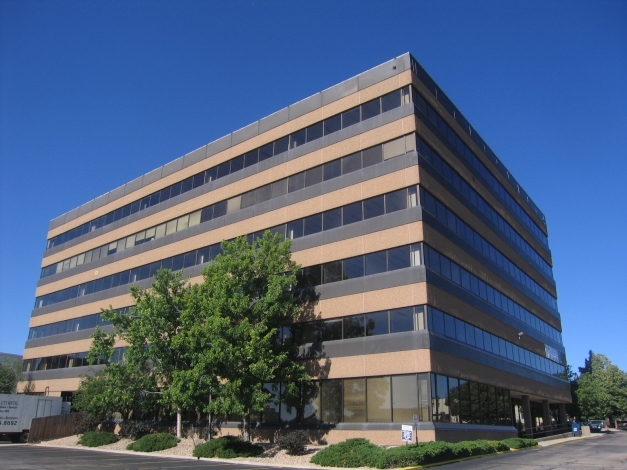 The CPE4U classrooms in Denver are located at 4380 S Syracuse St Ste 110, Denver, CO 80237 (at I-25 and I-225). You may attend in person in our classrooms OR join in a live Internet broadcast of most classes. To find seminars by DATE, go to the SEMINAR CALENDAR. To search for seminars by TOPIC, use the Search box above. To search by LOCATION, click on the Maps and Locations tab above. The PASS allows an individual to attend an unlimited number of CPE4U seminars during the season (online or in person) for a fixed rate. For more information or to buy an individual pass, visit the PASS page. For information on a flat-rate corporate PASS for two or more employees of a firm, call us at 720-389-5900. If you know you want to take 4 to 6 days this year but have not chosen the courses yet, you may buy 4 or more credits by June 15 at $150 per day. To buy credits, visit the Credits page. To use a credit, call us at 720-389-5900. To do more than just browse, you must create a user account on this website. It is fast and easy! To start, just click on Create Account, above. If you have a Pass or have taken classes with us in the past, be sure to link up with your existing record. After you create your account, to register for a class, log in, go to the Seminar Calendar, select the class, add it to your cart, and check out. If you have a Pass, cancel registrations yourself (click on Details in your course list). Log in to your user account, go to the Seminar Calendar, and click on the class you want. Click on the appropriate green button to register to attend in person or over the Internet. The class will be added to your shopping cart, and you can then continue to add classes or check out. To check out, click on the shopping cart icon on the top right corner of any page, next to your name. Be sure to completely finish checking out (easy, but several steps). You will receive an email confirmation overnight for each registration. If your firm has a firm pass and you are the designated administrator for your firm, you can register your employees for classes and manage their registrations from your administrator login. For more information, contact us at 720-389-5900. Questions? Call us at 720-389-5900 and we will be happy to help! Call the office at 720-389-5900 (M-F 8:00 a.m.-5:00 p.m. Mountain time). 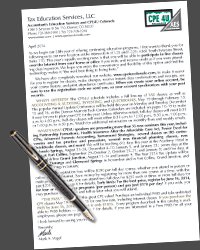 To save a PDF copy of the 2019 CPE4U Catalog to your computer, right-click on the image at left and choose "save target" or "save link" (2.5MB). For information on Accountant's Education Services and the Annual Federal Tax Refresher Course: www.aestax.com. For information on the Denver Tax Institute, July 22-23, 2019: www.denvertaxinstitute.org. There was an error loading the upcoming seminars. As we begin our 34th year of offering continuing education programs, the biggest news in tax is the ongling impact of the 2017 Tax Cuts and Jobs Act and its impact on the current filing season. Don't miss this year's edition of the updated Deduction for Qualified Business Income seminar. The provisions of the new Act will be incorporated into all our other tax classes as well, as appropriate to the topic and mentioned in the course descriptions. As always, CPE4U offers you a full line-up of TAX classes, as well as ACCOUNTING & AUDITING, INVESTING, and QUICKBOOKS, including short classes early in the year especially for newer tax professionals. A full schedule of programs is offered from April 29, 2019, through February 7, 2020. The popular Annual Update Conference will be held on Monday and Tuesday, December 16 and 17, 2019, at CPE4U Colorado and broadcast online. CPE4U Colorado is not affiliated with the University of Denver.